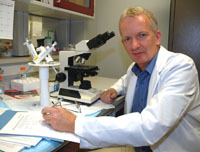 Alistair Ramsay, PhD, earned his BS in Physiology from the University of Otago in New Zealand in 1978. From there, he went on to complete his BS in Microbiology in 1979, as well as his PhD in Microbiology in 1986. Dr. Ramsay is Professor of Microbiology, Immunology, and Parasitology, as well as Director of the Gene Therapy Program for the LSU Health Sciences Center School of Medicine.